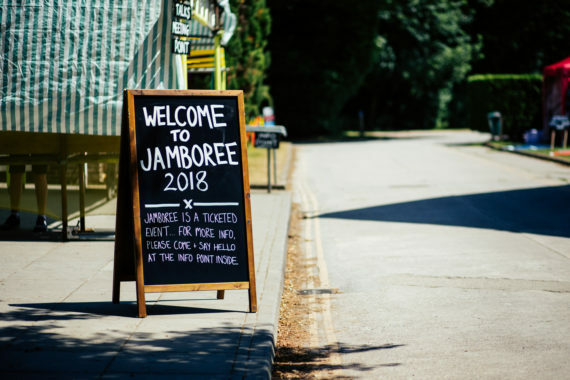 The Jamboree team will be blogging here to share our preparations for Jamboree 2018 taking place on the 28th June – 1st July 2018. Artists LOW PROFILE invite visual artists, curators and programmers to become involved in co-delivering a programme of presentations, micro-exhibitions, activities and discussions to share practice at Jamboree 2018. 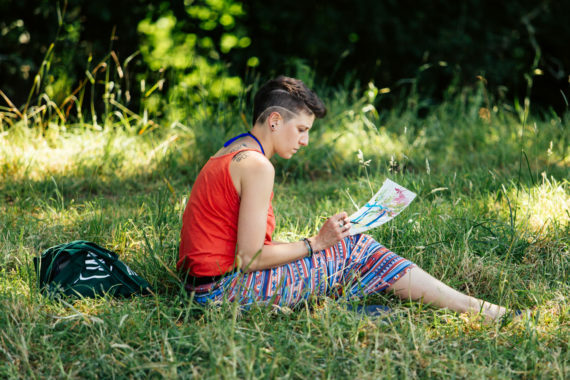 The event will take place from the 28th June -1st July 2018 in a relaxed outdoor setting, on the Dartington Estate near Totnes, (Devon, UK) and will bring together 150 visual artists, curators & programmers from around the UK. LOW PROFILE hope that attendees will meet new people, find out about each other’s work, build new relationships and make connections that lead to new projects. Who is the Jamboree team? 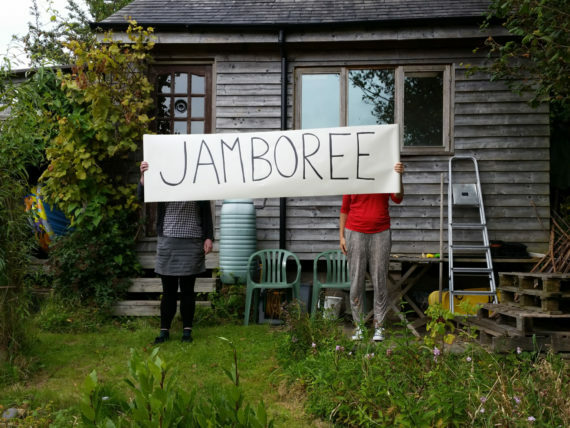 Jamboree is devised by LOW PROFILE – artists Rachel Dobbs & Hannah Rose (nee Jones). They are the driving force behind the on-going Jamboree project. 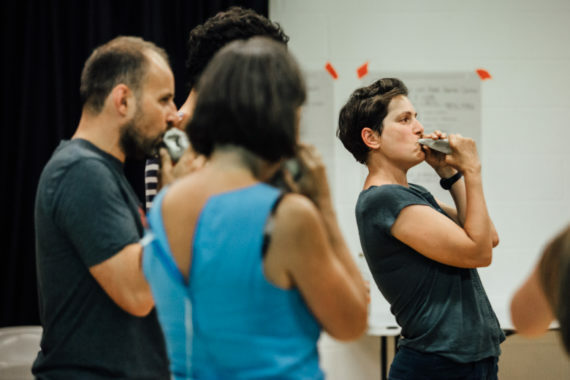 As artists, LOW PROFILE are committed to delivering ambitious artist-led activity in Plymouth & across the UK – including PL:ay festival (2007), Come to Ours (2011) and Jamboree (2015, 2018 – ongoing). Vickie Fear is an independent producer and curator of contemporary art exhibitions, commissions and events, based in Plymouth. Vickie previously worked as the Assistant Curator at Plymouth Arts Centre. She is also a Visual Arts Plymouth Activator, PAC Home member and one of the organisers of Counter, the Plymouth art book fair. Vickie maintained an artist practice until 2015. 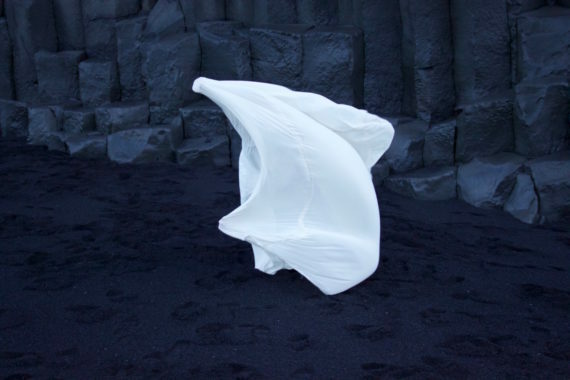 Beth Emily Richards is an artist, researcher, and producer based in Plymouth, UK. 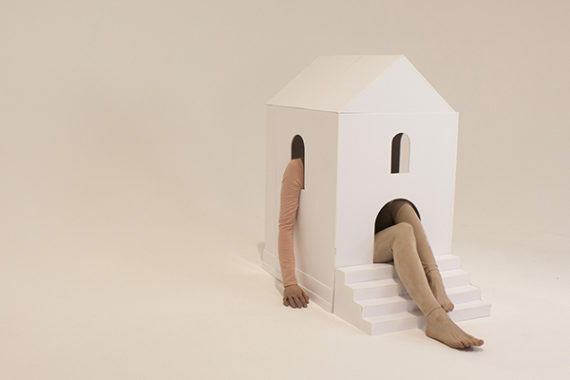 She is involved with several artist-led curatorial projects, including Video Social Club and Sister Sister. Her broad research interest is critical iterative methods of art making, including reenactment practice, fan labour, and myth-making. How can we find out more about Jamboree? With thanks to project partners a-n and Plymouth College of Art, and project supporters Plymouth Culture, Visual Arts South West, CVAN-NW, PAC Home, ESP, WARP, Somerset Art Works, Spike Associates, CG Associates. A very early start to day three of Jamboree – up and dressed for a 430am walk and talk session led by Bram Arnold: ‘From Civil Twilight To The End of Time [An adventure into the anthropocene]’. Artist-researcher Bram led us on a session that was part way between a Quaker meeting, a reconvening of the Dead Poets Society and a performance poetry ramble. A beautiful way to wake up to the Dartington site – and a small and very friendly herd of cows decided to join us for the last part of the session. Next up for me (after coffee) was a 20:20 session. Two which stood out for me were Stuart Robinson and Antigoni Jasidi’s presentations. 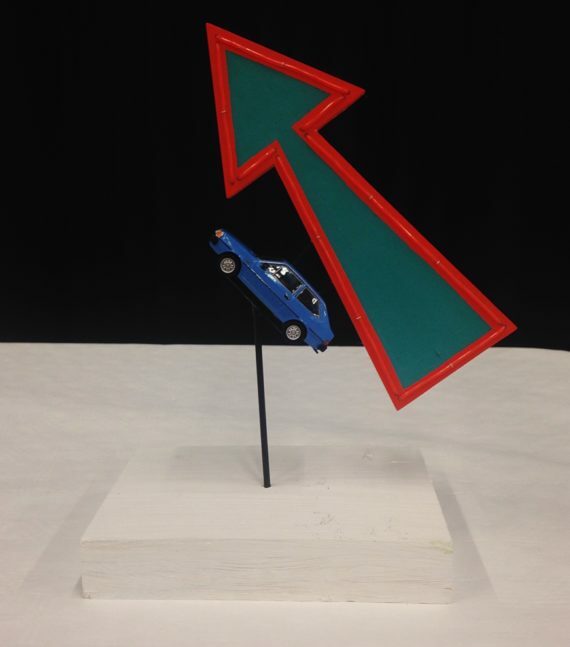 Stuart Robinson‘s talk looked at the use of signage and landscape within his practice, exploring the line between natural and cultural imagery of landscapes. Antigoni Pasidi spoke about her exploration of the intersections of sculpture and performance and the staging that is inherent in both disciplines. I then joined a communal making session led by artist and writer Mark Leahy: ‘Telling time: a speech-choir making session’. We participated in some voice games, worked in pairs and as a group to create fragments of narratives. Having built a score exploring temporality, we presented a short speech-choir performance. Mark created some beautiful participant workbooks, with a useful bibliography at the end – workshop ephemera to take away and treasure. I was then back out into the fresh Dartington air to participate in Rosalie Schwieker’s walk and talk, ‘Terms and Conditions’. 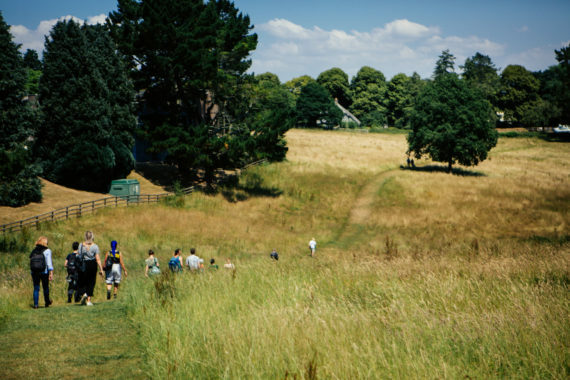 During the walk around the estate, we discussed what our individual T&Cs as artists may be, something to add into artist agreements or contracts when negotiating with arts organisations (or other artists). Rosalie gave examples ranging from not travelling by plane, to having work-free weekends. We then partnered up with an accountability buddy who we would check in on and vice versa in a year’s time. Continuing with the walk and talks programme, I then joined green and owens in their first outing of their project ‘Walking Towards Korea’. 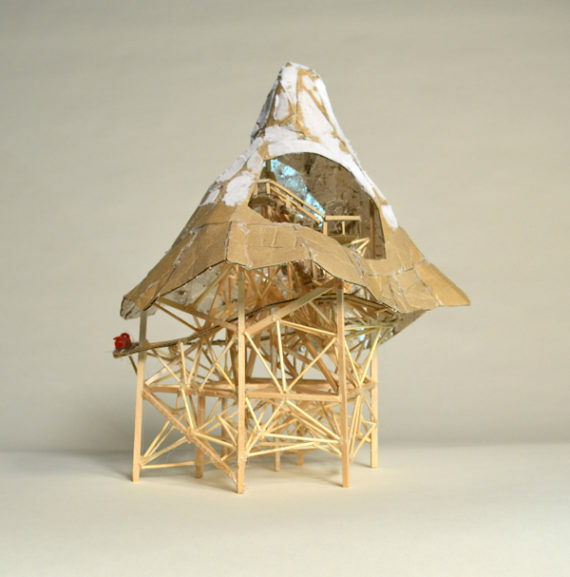 In their words: ‘For the last year we have been working on an idea with our friend Youngshin who is in South Korea. The intention is that we walk the miles to her (in our own environment) and that she walks the miles to us (in her own environment), ‘meeting’ somehow in the middle, and reflecting on the way about friendship and distance.’ The walk prompted thoughtful discussion around our own friendships in and out of arts ecologies. It ended with a tipple of friendship whiskey – always a fine finish to a walk! 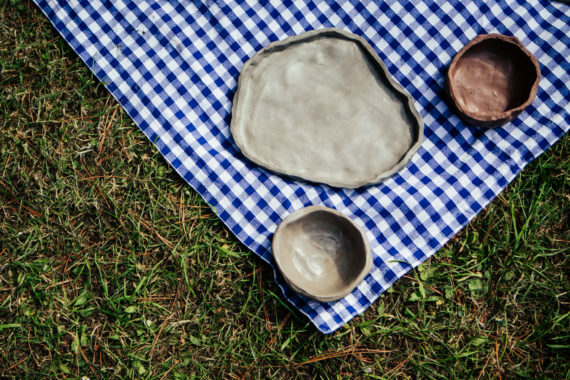 up picnic giving participants a chance to discuss the process of making, social objects and the social role of food in the outdoors. 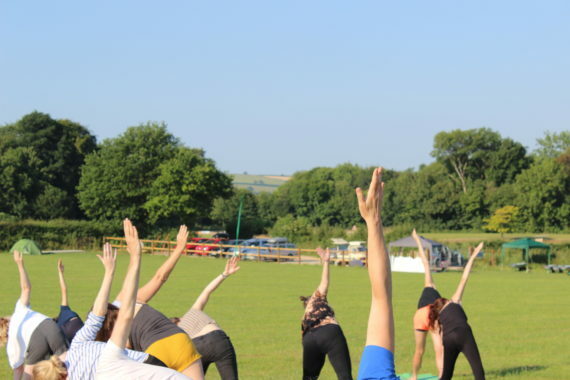 My second day of Jamboree began with an early morning yoga session with artist and yoga teacher Carly Sellers. Great to stretch after the inevitable slow deflation of the camp airbed! Yummy coffee from Dartmoor-based Peace and Coffee also ensured I was ready for a jam-packed programme. I attended the seminar led by curator Lucy Day, which started with the provocation: is separation the best way to tell marginalised stories? Day used her current curatorial project ‘A Woman’s Place’ based at Knole, a National Trust property in Kent, to kickstart group conversations around developing projects outside of the white cube. A Woman’s Place at Knole shines a light on historical women’s voices, through six contemporary art commissions by Lubaina Himid joins CJ Mahony, Lindsay Seers, Emily Speed, Alice May Williams & Melanie Wilson whose themes encompass love, betrayal, class, gender and inheritance. 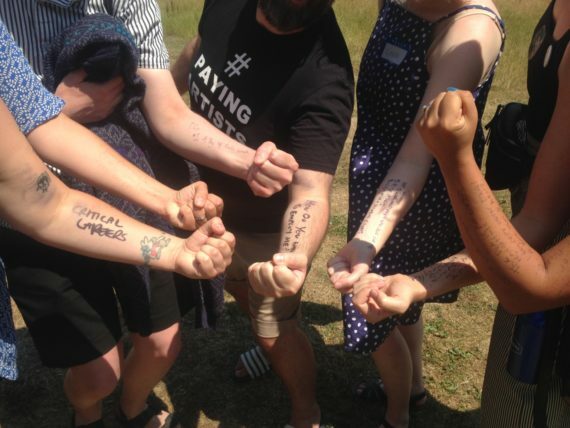 It was a fantastic and discursive session where we shared ideas around working with and without institutional power structures, the blurry lines of participation, collaboration and co-authorship, and the politics of naming yourself a feminist practitioner. Lots of the conversations continued after the seminar session ended – a lot to talk through! I started the afternoon with a 20:20 session. The 20:20 programme strand are a series of quick fire artist talks in a pecha kucha format; where artists share twenty slides for twenty seconds each. 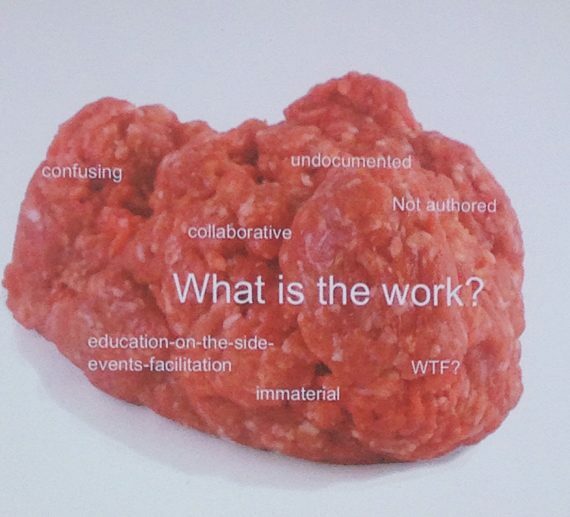 I loved hearing about Rosalie Schweiker’s notion of being a sausage artist vs a mince artist – the former being an artist whose practice follows a traditional trajectory of commissions, awards, solo shows, and gallery representation, while the latter embraces a methodology of making that may not translate well to documentation, that is often immaterial, and often collaborative. Long live the mince artists! Green & Owens shared their collaborative practice and ideas around friendship, domesticity and precarity via wonderful performance scores. Jamboree founders LOW PROFILE shared recent works and their plans post-Jamboree, which include a civic planting project working with Plymouth-based arts organisation Take A Part. I then soaked up some sun with Simon Bayliss’ Walk and Talk session, Landscape Painters Anonymous. It was lovely to have a part of the day to focus on creating after discussion and absorbing a lot of information, as well as taking a closer look at the amazing context of the Dartington Estate. 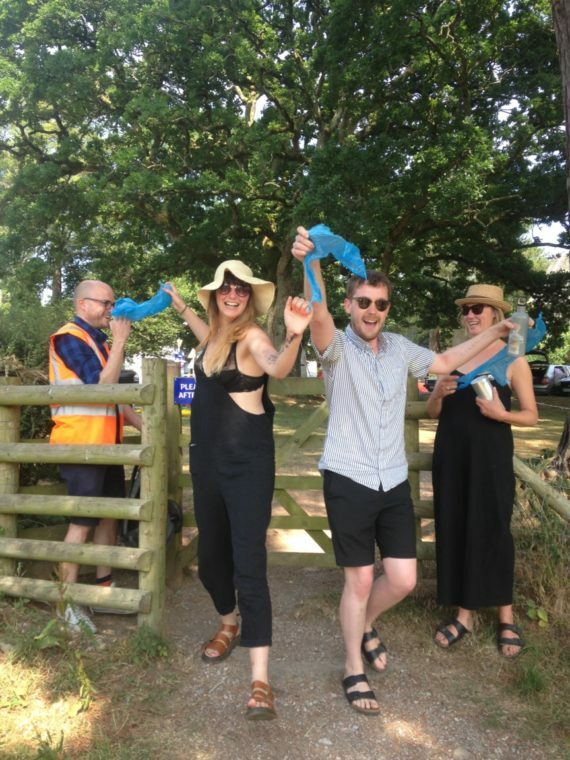 I continued participating in the walk and talk sessions with Plymouth Art Centre Assistant Curator and Dartington alumnus Lucy Rollins’ session playfully titled ‘Wassup Dartington’. Lucy shared personal and historic narratives and anecdotes of the site. Big thanks to Lucy for soldiering on despite her knee injury, thankfully the only tent –induced minor wound sustained! I then attended AJ Stockwell’s incredible Communal Making session ‘Sonorous Stones’. AJ led us in a human-geologic choir, as we activated her ceramic stone-formed instruments to create an otherworldly sound and atmosphere. AJ was an awardee of a bursary place sponsored by WARP (Wales Artist Resource Programme); there are 36 artists attending on such bursary schemes via artist associate schemes over the UK and its brilliant to have the practitioners with us this weekend. A real highlight of the day was Simon Lee Dicker’s ‘Silent Swim School’. 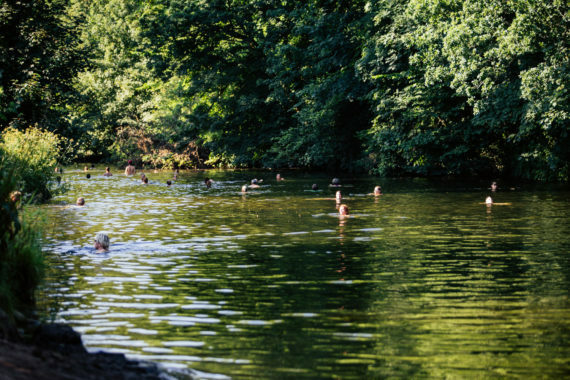 The group silent swim in the river Dart provided a moment to reflect on the day’s discussions and workshops and a chance to cool off. After some delicious Punjabi food by Plymouth-based Desi Junction, I finished the day by watching Jamboree’s Moving Image programme. 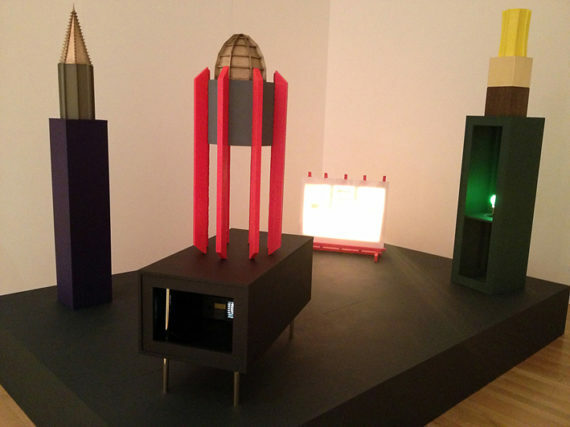 Films that struck a chord with me included Bryony Gillard’s ‘A cap, like water, transparent, fluid yet with definite body’, Megan Broadmeadow’s ‘Let The Stars Be Set Upon The Board’, and Jenny Cashmore’s ‘In and Out (Building Circuits)’. All image credits Andy Ford unless otherwise noted. 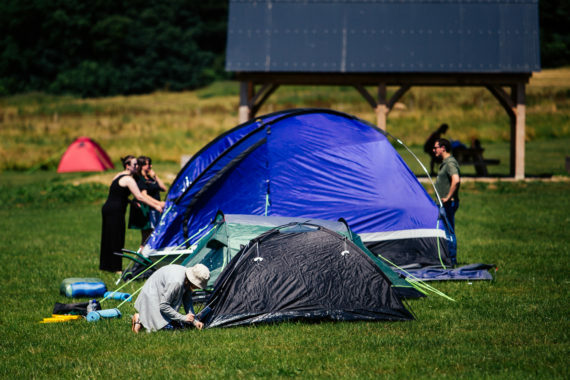 Over a year in planning and development, Jamboree is finally here – and we are so excited to welcome 150 artists and curators to sunny Dartington! 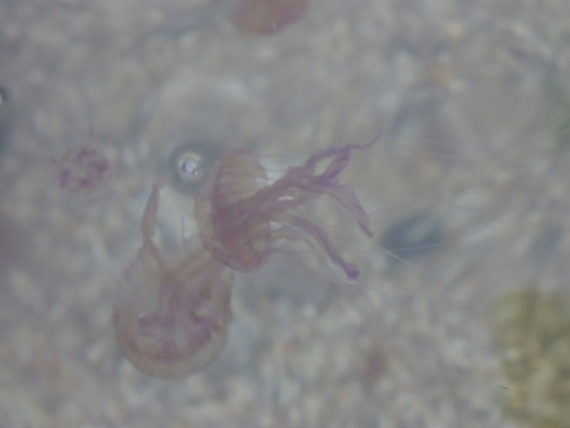 I’ll be reporting on site each day, and full reports from our team of observers – Fine Art students from our partners Plymouth College of Art – will be sharing follow up reports from their perspectives. Please do follow us on Instagram @artistsjamboree where we’ll be sharing a lot more documentation and behind the scenes shots too. 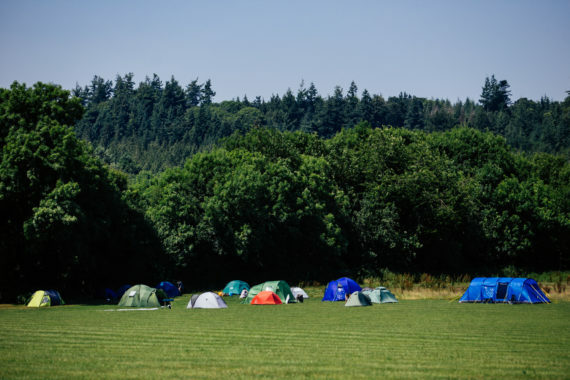 Yesterday (Thursday 28th June) began with artists and curators arriving from all over the country, from Newcastle to Newlyn, and pitching their tents on the beautiful Dartington campsite. 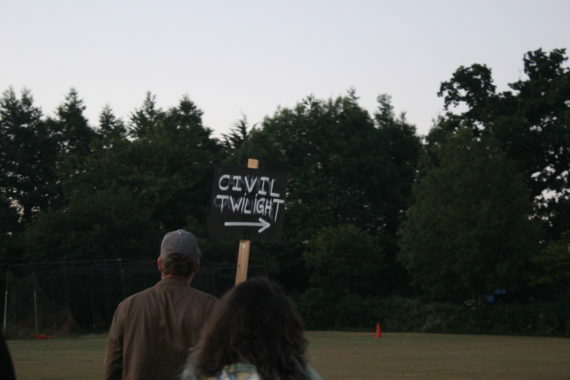 Early arrivals explored the Dartington grounds, viewed artists moving image curated by Video Social Club, and dropped off multiples and editions to sell in the camp shop, and small works to display in the miniatures exhibition. We then heard from Hannah Pierce who explained why a-n decided to partner with LOW PROFILE on Jamboree, and how it is an example of how artists can come up with exciting solutions to their own creative and professional development needs. Keep it #artistledtilimartistdead! The final presentations were from Friday’s seminar speakers, who gave a brief introduction to their artistic and curatorial practices and raised some of the provocations they would be exploring on the following day. We are lucky enough to have a diverse and fascinating group of practitioners to lead the seminar sessions: curator Alistair Hudson of Manchester Art Gallery and the Whitworth, who asked, ‘If we truly want to democratise art, should we abandon exhibitions for good?’ Curator Simon Morrissey of Foreground introduced the idea of dichotomies of centres versus peripheries in the art world. Artist Sonya Dyer used the philosophy of Franko Beradi as a position to ask: ‘how are we going to live with each other in the future?’. Curator Lucy Day of A Woman’s Place (and Jamboree project supporter and critical friend) questioned: ‘Is separation the best way to tell marginalised stories?’. And finally curator Ingrid Swenson of PEER interrogated what is meant by socially engaged practice. The evening finished with delicious food from The Real Junk Food Project, a brilliant organisation that saves food waste, screenings from BEEF (Bristol Experimental and Expanded Film), a bar, and chats at the campsite under a full moon. The perfect start to the long weekend of Jamboree! Artist duo LOW PROFILE are pleased to announce the participant-led programme for Jamboree 2018. 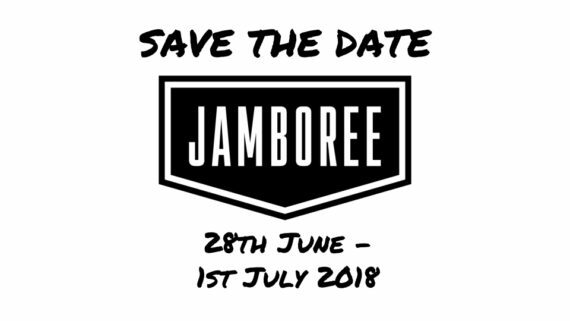 Jamboree 2018 will take place from the 28th June – 1st July at the Dartington Estate in Devon. 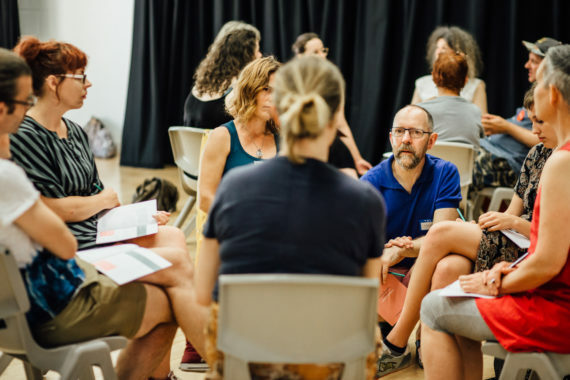 It is an artist-led project focused on offering a space for artists and curators to make new productive relationships and share practice in a critically engaged, supportive environment. The 4 day event will draw together 150+ artists, curators and programmers from across the UK for an intensive weekend of talks, workshops, walks, exhibitions, seminars, screenings and an artist shop. Thanks to Plymouth College of Art, PAC Home at Plymouth Arts Centre, Extra Special People at Eastside Projects, CG Associates at Castlefield Gallery, WARP at g39, Spike Associates at Spike Island, Visual Art South West, Somerset Art Works, and CVAN North West; the Jamboree team have been able to offer 32 artists and curators bursaries, covering the cost of tickets (including camping). 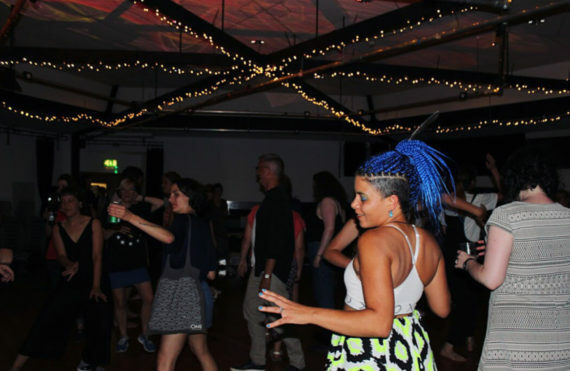 The artists and curators who have been awarded bursaries and those who have already purchased tickets are listed on the newly launched Jamboree participants directory, available at: https://artistsjamboree.uk/jamboree-directory. The directory will continue to be updated and aims to become a useful resource for attendees to stay in touch & for others to find artists & curators based around the UK.